The road into the camp is always a challenge.The brief exposure we got to the mountainous Rincón de Guadalupe habitat on the MABA trip in August (read the full story here: Rincón de Guadalupe) convinced us the area was worth a thorough survey to determine what large animals might be present. So in early September we revisited the site and installed two trail cameras, one a half-mile downstream from the property’s buildings, another about a mile on in the same drainage. Last week, we returned to download images and evaluate the effectiveness of the cameras’ positions. In addition to Roseann and myself in our diesel FJ60, four volunteers and friends were along: Brian DeArmon and Marisa Rice, driving a Dodge diesel pickup equipped with a Four Wheel Camper they had bought cheaply and finished renovating (superbly) scant minutes before leaving, and Chris Marzonie and Brian Jones, in Chris’s well-used and thoughtfully modified Toyota Tacoma. Beautiful fall hikingOn any serious scientific endeavor such as this—particularly one to as remote an area as we were tackling—pre-trip planning must stress above all those things without which the expedition could fail. Therefore the week prior to departure comprised a flurry of emails: Who was bringing the bacanora, and who had tequila? Was Jonathan stocked up on Bass Ale? Would three pounds of meat be sufficient for Brian and Marisa’s group dinner menu of sauteed pork and squash, and would two dozen eggs be enough to scramble with the leftovers for breakfast the next morning? Cookies? Chocolate of at least 72-percent purity? We’d be burning a lot of calories; no one wanted to hold back the group just because dessert had been a little skimpy. The only person left out of this strategizing was poor Brian Jones, a self-inflicted vegetarian doomed to watch us scarfing Chris’s sirloin fajitas while he choked down watercress cutlets or something. The only thing that saved him from a completely miserable weekend was the fact that tequila, beer, and chocolate (of which he provided generous amounts for all) are indubitably vegetable-sourced. That and his suspiciously smooth skills at poker . . .
Chris Marzonie whips up fajitas.Finally, ARB and Engel fridges stuffed to capacity, we hastily tossed spare batteries and SD cards for the trail cameras into the glove box and headed south. After a leisurely two-day trip across the border, the four of us who were Four-Wheel-Camperless installed ourselves with fat down sleeping bags in the rainproof but drafty dormitories at Rincón de Guadalupe, while Brian and Marisa made sure all the windows were half-open in the camper so their propane radiant heater wouldn’t make the interior too ghastly to endure. Next morning we loaded up day packs and headed east along a ridge trail that rapidly faded to nothing, then bushwhacked down the steep slope to the creek and located the camera, still safe in its mount. We knew there’d be a lot of cow shots on the Bushnell, but given roughly 4,000 exposures possible on the 8-gig card, we hoped there’d be room for wilder species. And we weren’t disappointed. First to show was a grey fox, who in subsequent images proved to have a remarkably consistent schedule on his nightly patrols. Then as we scanned through frame after frame of cow and squirrel, suddenly there was that unmistakable lanky shape of a mountain lion, strolling Checking camera for imagesupstream through two successive frames of infrared-flash-lit nighttime shots. As an apex predator, few animals prove the essential health of an ecosystem as definitively as a cougar. The initial MABA survey had already shown the Rincón de Guadalupe property to be a rich sanctuary for an abundance of wildlife; this was the exclamation point on that catalog. But we weren’t finished. Between the two cameras we also caught clear images of bobcat, javelina, white-tailed deer, ringtail, coati, hooded skunk, and turkey. The latter was as good news in terms of ornithology as the cougar had been for mammalogy. 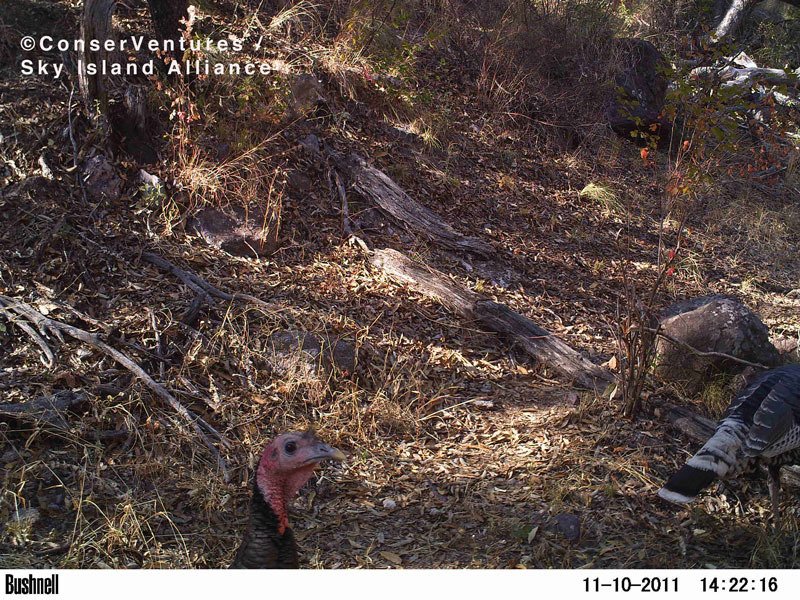 Wild turkeys were once widespread in the southwestern sky islands but have lost much of their range. Oh, and, one more: A tiny smidgen of a puppy, barely a month or two old, one of the passel of dogs resident at the lodge. Apparently exploring out on his own, the photo caught him striding along, ears up, as if he owned the world. We immediately dubbed him Ernesto, after Shackleton. With little discussion, we decided to recharge both cameras and leave them where they were. Spurious photos of squirrels and cows are of little consequence when such a variety of other species show up in the remaining frames. Given the lively activity after two months on just a pair of cameras (80 non-cow/squirrel/alien photos on one camera; 45 on the other), we have hopes of equal diversity when we check back in the spring. There’s still a chance of ocelot in the area, perhaps even jaguar. We carried the two SD cards like precious stone tablets on a bushwhack back up the huge boulders over which the creek cascaded, and made camp in time to safeguard all that data before dinner by downloading it to redundant Mac notebooks, ensuring it for posterity and the benefit of all mankind. But first, where’s that bacanora? We need a toast. Interested in joining a future expedition as a volunteer? Click here for information. Postscript: A new jaguar sighting in Arizona. This is the first jaguar recorded in Arizona since Macho B, whose sad fate is well-known: the 15-year-old cat, which had been living in Arizona and Sonora for at least 13 years, was snared, radio-collared, and then euthanized in 2009 when the trauma of the purported “inadvertent” event started shutting down his elderly organs. The Arizona Game and Fish Department has denied being involved in the capture, stating that the individual responsible, an AGFD contractor working on a lion and bear study, acted on his own, and without their knowledge. AGFD is cooperating with the ongoing federal investigation of the death. But on to better news, it was announced almost concurrently with this sighting that a new, $771,000 study by the University of Arizona’s Wild Cat Research and Conservation Program will use cameras placed across southern Arizona and southwestern New Mexico to look for Fenn’s jaguar and any others that might be living in the region. Ocelots, recently rediscovered in southern Arizona, will also be a focal species of the study. And of course a side benefit will be a survey of all the same sorts of animals we found in the Sierra Madre, plus dozens of other species. It’s clear to biologists that southern Arizona and New Mexico have been extreme fringe habitats for jaguars for a long, long time. The fact that every jaguar recorded north of the border has been a male is significant: Males typically range much wider than females, and lone males frequently wander dozens of miles beyond their known breeding range. Conservation for jaguars—and other species, from deer to ocelots—involves protecting the generous expanse of habitat we already enjoy in southern Arizona and New Mexico, and identifying where jaguars range so we can add protected habitat where possible, to ensure continued opportunities for their survival here. Then we can simply be thrilled at the idea of an occasional wandering male jaguar either visiting or perhaps taking up permanent residence. The “top down” approach to wildlife conservation is a proven strategy: If you have habitat that supports high-level predators such as jaguars and mountain lions, you can be sure the same habitat supports tremendous numbers of “lesser” predators, herbivores, birds, reptiles, amphibians, fish, and arthropods. In short, you have a complete, self-sufficient ecosystem.